Andrew’s Fashion bet on the classical elegance and sports line. Men’s garments were designed for the businessmen and fit completely on the active daily round. MON AMUOR: LADIES, THINK UNCONVENTIONAL! Polia Milanova ( for Mon Amour fashion house ) designed that collection for the “unconventional “ ladies and put the accent on two themes – bride dresses and gowns. Beautiful collection and the spontaneous charity gesture of El Grado Jewelry House made a lovely impression during the auction of the first three copies of Almanac. El Grado placed one of the most expensive jewelry at auction’s disposal. Miss Evgenia Kalkanjieva, president of Visages Model Group, bought back the precious necklace. Jewelry collections, represented in Bulgaria by fashion houses like El Grado, made the eclecticism actual. Black and white combination is classical but still very actual and even more deeper. Gold-brown collections are untraditional and impressive. At the premiere of the new Almanac El Grado Jewelry collection was presented with gowns from Bulgarian designer Evdokia Dimitrova. We are exceptionally thankful to: Inter Expo Centre; Agressia Fashion House; Bonjour; Avtomotor Corporation Importeur General; Estee Lauder and Clinique; Savoy Club; Downtown Hotel; Lavazza; Municipal Insurance Campany PLC; Gorna Bania Mineral Water; Adriana Intercoiffeur Wien. Without them the premiere of Almanac of Bulgarian Fashion wouldn’t be possible. Almanac of Bulgarian fashion 2003-2004. 3. – 4. 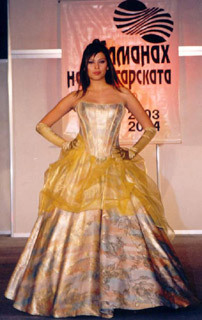 Designs of Andrew’s Fashion at the premiere of Almanac of Bulgarian fashion 2003-2004. 5. – 6. Designs of Polia Milanova for Mon Amour at the premiere of Almanac of Bulgarian fashion 2003-2004. 7. – 8. El Grado Jewelry at the premiere of Almanac of Bulgarian fashion 2003-2004.